Battersea locals are very fortunate to have this traditional Italian restaurant on hand. 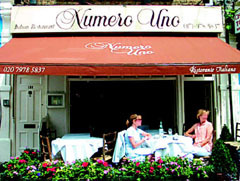 Numero Uno serves excellent, freshly prepared authentic Italian food in a relaxed and friendly atmosphere. Now open for 5 years this very popular local restaurant, where you will instantly feel at home, is decorated in typical Italian style and also has a small pavement terrace for al fresco dining (weather permitting). Open every day noon-3pm and 6.30-11.30pm All major credit cards accepted (not Diners). No service charge. Traditonal Italian restaurant serving excellent freshly prepared food.